If you’ve found a dental team you can trust, you know how important that partnership is to make you feel relaxed during your appointment and confident in treatment recommendations. Your dentist likely feels the same about their relationship with the dental lab. When a dentist finds the right lab, that relationship can improve the entire treatment process for patients, but you may never know it. Keep reading to learn more about how the relationship your dentist has with the dental lab will make all the difference in keeping you smiling. Knowing that your dentist can always rely on a dental lab to produce quality results precision crafted to their exact specifications is key to delivering picture-perfect results. 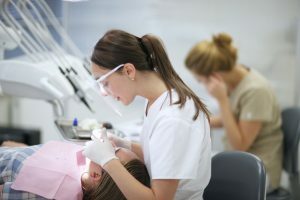 The only way to know for sure a dental lab is going to produce these great results is to find a dentist who has a trusting, established relationship with their dental lab. When the lab has gotten to know and understand your dentist’s treatment plans, they will deliver results that meet the exacting specifications and leave you with flawless smiles. In recent years, more and more dental labs are closing or consolidating. That means having a good relationship with the dental lab is even more important. Rather than moving down to the end of the lab’s growing list of restorations, the dentist may be able to ensure your restoration is completed sooner rather than later. You’ll also know that the best materials are used and the most precise, hand crafted results will be returned, so your newly repaired teeth will look, feel and function just like your natural smile. At the West Monroe dental office of L. King Scott, DDS, we are proud to partner with the skilled team at Smile Science Dental Laboratory to provide our patients with the highest quality, longest lasting, most natural looking restorations. If you would like to learn more about our caring dentistry team or the skilled dental lab team at Smile Science Dental Laboratory, call our office to schedule an appointment. We’re always here to help. Whether you want to learn more about our team or decide whether our office is right for your family before scheduling your first appointment, you can always come back regularly to read our blog to learn more about our caring team and the services we provide.